A bubble may have just burst. Flowering marijuana plants are pictured at the Canopy Growth Corporation facility in Smiths Falls, Ont., Jan. 4, 2018. After a massive run-up over the past several months, marijuana stocks have entered bear market territory. Did a bubble just burst in Canada's marijuana market? Only time will tell, but one thing is clear: the buzz is wearing off for marijuana investors. After a massive run-up over the past several months, weed stocks have entered bear-market territory. The Canadian Marijuana Index plunged nearly 12 per cent on Friday. Watch: What will marijuana legalization mean for Canada? 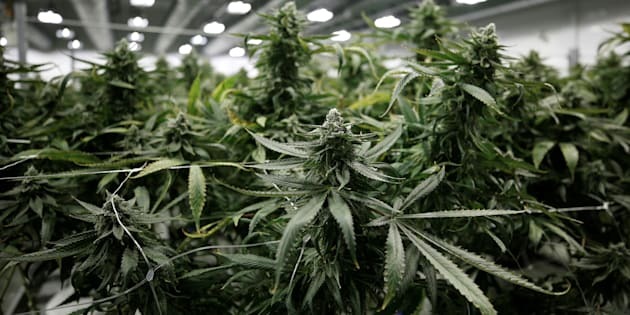 PI Financial analyst Jason Sandberg told Bloomberg News the sell-off was in part due to investors who had bought into pot in recent weeks, but didn't see the sorts of gains earlier buyers did. "There's a lot of investors that got in in the last month and many of them are looking at significant losses," he said. "It now looks like it's a pile-on. There's a bit of panic selling." After growing nearly four-fold in value in the last months of 2017, Canadian pot stocks peaked in early January and have since lost about 35 per cent. That sort of rapid growth led to rampant speculation that weed stocks were in a bubble — speculation that itself may have soured investors on the stock. "Everyone compares this to the dot-com era," Chris Damas, editor of the BCMI Cannabis Report, told CBC News last month. "You could throw a dart and hit a winner in cannabis." Perhaps not anymore. Every single stock that makes up the Canadian Marijuana Index lost ground on Friday, with market leader Canopy Growth, the largest publicly-traded pot grower, down more than 12 per cent. In all, some $2.7 billion was wiped off Canada's marijuana markets on Friday alone. In a tweet Friday, Damas urged investors not to "sell into a panic." We have put out a buy on one stock and are recommending people do not sell into a panic. They should have been trimming their sails all of January. The rout didn't take place in a vacuum; it came amidst a downturn in other "hot" investment vehicles, such as bitcoin, which had its worst day in five years on Friday, dropping below the US$8,000 mark for the first time since November. That asset class is also exhibiting a classic pattern of having experienced a bubble. It was a down day on the broader markets as well, with the S&P TSX down nearly 250 points, or 1.57 per cent, on the day, closing at 15,606.03. In the U.S., the Dow Jones suffered a steep 665-point drop, down 2.6 per cent to 25,520.96. The index saw its worst week in about two years, dropping about 1,000 points for the week. Mike Baele, managing director at U.S. Bank Wealth Management, said a lot of the downward pressure has to do with fears that interest rates will be rising. "The old adage is: 'Bull markets don't die of old age, they are killed by higher interest rates.' That looms large," he told CNBC.